Explore the stories of African American luminaries who have lived in the area — W. E. B. Du Bois, James Weldon Johnson, to name but a few—as well as the lives and times of the many ordinary yet extraordinary African Americans who have made their marks in the region from the 1700s to the present. Tour 10 sites in Stockbridge, Great Barrington and Sheffield associated with Mum Bet’s life and quest for freedom. Explore Jacob’s Pillow and its contributions to the heritage of the African diaspora. View 15 sites in Pittsfield associated with Rev. Samuel Harrison, baseball hero Ulysses Frank Grant, Chief Justice John Garrett Penn, astronaut Stephanie Wilson, and other influential African Americans. Discover 17 sites in Great Barrington that reveal the town’s people and places as Du Bois recalled them. Visit 24 sites in 12 communities from Dalton, MA to Sharon, CT honoring the Berkshire and Litchfield men who served in the “Glory” regiment. Visit sites related to African American history throughout Old Deerfield. View the 1704 French and Indian raid on Deerfield, as seen through the eyes of the various participants. Uncover the Old Town Common, abandoned in the late 19th century, through walking and virtual tours. Uncover the history of abolition in Florence through a walking tour of 18 sites on the African American Heritage Trail. Interact with history through this bi-lingual website which explores nearly 100 civic, industrial, commercial, and residential locations throughout Holyoke. Seven historic markers link selected sites from Florence Center to the Bridge Street Cemetery. Each marker provides a link in a chain of interpretation telling the story of Northampton’s history. Containing colorful historical photographs and prints, these site markers tie history and place together. A self-guided tour of the streets and buildings of Worcester’s Canal District. This tour highlights eleven buildings that reflect the history of both the city and the neighborhood. Explore Salem’s rich history with this interactive app featuring numerous historic sites and points of interest. Get to know General George H. Gordon, a Civil War hero and commander of the Massachusetts 2nd Regiment. Raised in Framingham, Gordon’s life here revolved around the Centre Common, from his early days at the Framingham Academy, to his retirement in the family homestead on the Sudbury River. The inaugural program on the Framingham History Center app is a self-guided walking tour of the Centre Common as General Gordon saw it. Discover the 45 acre Gore Place estate and its role in 19th century New England farming. A walking tour mobile application explores Boston’s early religious history, with a particular focus on the decision-making practices and contentious issues that characterized life in seventeenth-century Boston. Explore the history, horticulture, and lives of those now buried in Mount Auburn Cemetery through four tours available as smart phone apps. Discover more than 200 Boston women in a wide variety of settings, occupations, and backgrounds in a series of seven walking tours. Freedom Trail Walking Tour is the ultimate interactive app that introduces you to Boston’s famous Freedom Trail. This app makes it fun to learn about Colonial Revolutionary Boston. You get maps, pictures, descriptions and YouTube videos of all 17 historical stops on the trail. Anyone interested in the War of 1812 or early American history would enjoy The War of 1812, with a companion website that includes the entire film online as well as a smartphone app noting locations of War of 1812 historical sites. The one-mile Liberty & Union Walking Tour is a loop through Historic Downtown Taunton and gives an overview of the original buildings, places, and people who lived and worked Downtown. Take a walk along Main Street in Brockton and enjoy the installation of twelve photographic banners. Stroll down Main Street in Nantucket with this app that highlights the histories and architecture of 30 houses between the Pacific National Bank and the Soldiers & Sailors Monument and reveals the story of Nantucket’s whaling prosperity, decline and rebirth. Explore Provincetown – from the signing of the Mayflower Compact by the Pilgrims in 1620 to the staging of Eugene O’Neill’s first play in 1916, Provincetown’s harbor, homes and other landmarks are rich in a layered history and have inspired artists and tourists alike. 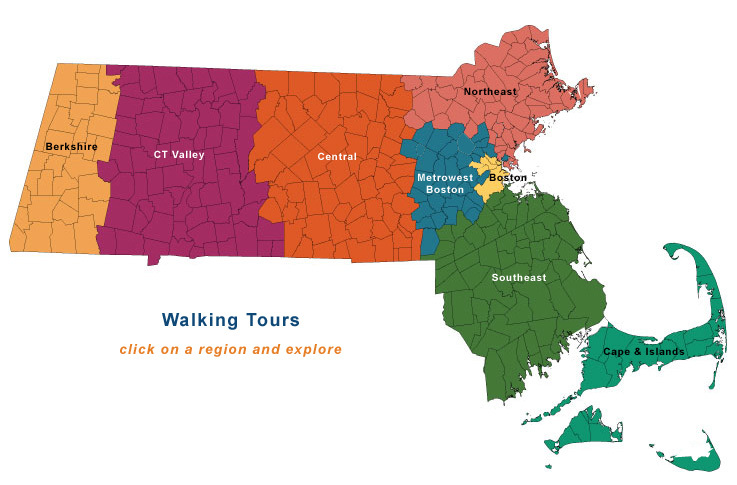 Do you know of other humanities walking tours in Massachusetts with an online presence? Email us!